I go through fits and starts of cooking a certain food over and over and over until I hit the saturation point and have to stop. Granola is one of those things. I’ll get hung up on a particular recipe and make it ad infinitum until no one in the house wants to even think about it any more. The current house granola that we love the very best is Slow-Cooker Blueberry Coconut Vanilla Granola. That’s right, we’re talking about granola in the slow-cooker. 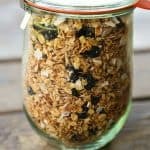 I used to do this on a regular basis several years ago, but then our tastes ran to a couple of granola recipes that weren’t well suited to the slow-cooker and I forgot all about it until a friend published a slew of slow-cooker granola recipes. I smacked my forehead with my hand as I walked to the mudroom to retrieve my slow-cooker. In under 10 minutes -which was mostly chewed up by me searching for my ground cinnamon in my overflowing spice cabinet- I had a slow-cooker full of fragrant granola starting to toast. Slow-Cooker Blueberry Coconut Vanilla Granola is almost laughably easy to make. Grease your slow-cooker, pour in the oats, stir together the liquids, pour over the top, stir and toss to coat evenly, add the lid and vent it a smidge, then stir every half hour for 2 hours or until the granola smells a little nutty and toasty. At that point, you turn it onto rimmed half sheet pans, stir in the dried blueberries and coconut and SHAZAAM; you now have the best granola at a fraction of the price of commercially available granolas. Sweet dried blueberries and coconut, maple syrup, and toasted oats play so nicely together. It’s easy to see why Slow-Cooker Blueberry Coconut Vanilla Granola is our favourite way to start the day, but I have to confess we eat this by the handful as the day goes on, too. Are you having trouble finding dried blueberries and unsweetened flaked coconut? You can buy the blueberries here, and the coconut here! Take the time to grease the inside of the slow-cooker crock generously. Make sure you get into the seams where the sides and bottom of the crock meet. This is an important step. I prefer to use butter, but extra virgin coconut oil can be used in its place. I would avoid non-stick cooking spray as the aerosols in it might become sticky on the walls of the crock. 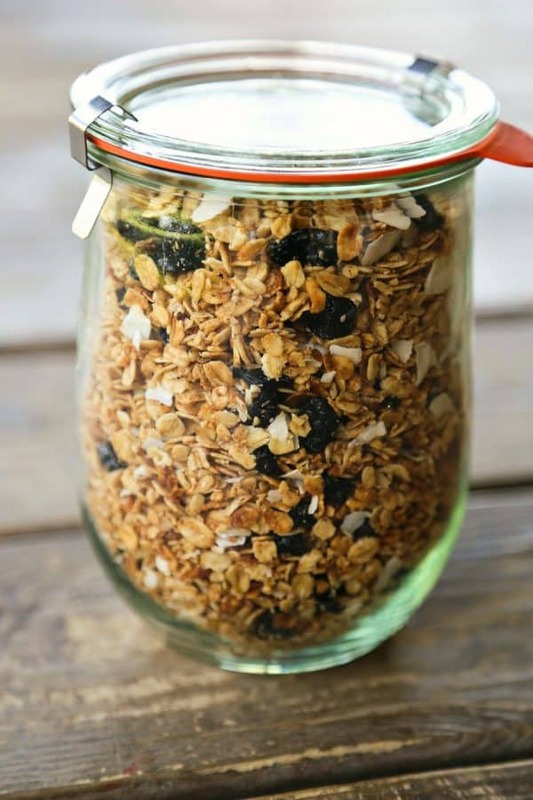 I use a 6 or 8 quart, oval slow cooker for Slow-Cooker Blueberry Coconut Vanilla Granola. It’s easiest to stir the granola in an oval slow-cooker, in my opinion. If you have a smaller, round slow-cooker, you may find you need to reduce the recipe by half to fit. If you don’t know what capacity your slow-cooker has, use a quart jar to measure water into it, counting how many quarts it takes to fill it. Psst. Interested in an 8 quart slow-cooker (the only way to go with a big family)? Here’s a link for one! Do prop the lid up slightly from the crock in order to allow moisture to escape during the cooking process. I lay a wooden chopstick along the narrow end of the oval and let the lid rest against it on one end, and against the crock on the other. This retains enough heat to toast the granola, but allows evaporation to occur without getting caught against the lid and dripping back into the granola. No chopstick? No problem. Use a butter knife the same way. Just be careful when you grab the knife as it will retain whatever heat the crock is giving off, making it pretty darned hot to the touch. I advise using an oven mitt if using a butter knife. 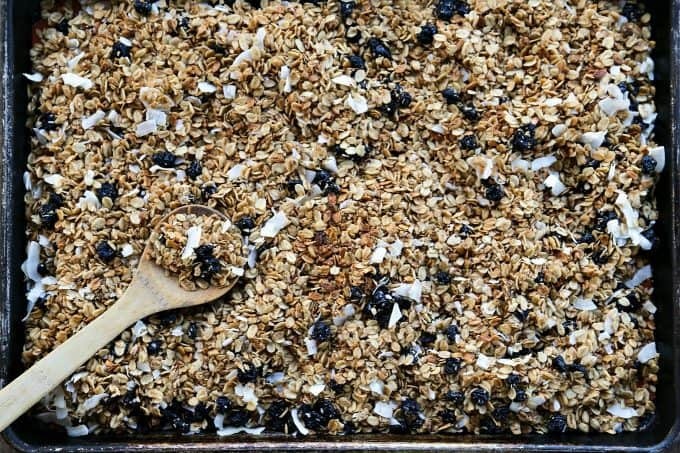 Don’t add the blueberries and coconut until the end when you transfer the Blueberry Coconut Vanilla Granola to the sheet pans to cool. They’re more delicate than the oats and far more prone to scorching which makes for not-so-tasty granola. If you prefer toasted coconut, you can toast it in a saucepan before stirring into the granola. I do this sometimes. Why spread the finished Blueberry Coconut Vanilla Granola out on cookie sheets, dirtying another pan? It’s simple. As the granola cools, it’s going to continue giving off moisture. You do not want this to be trapped under 6 inches of granola because that would yield soft granola. You want to make it as easy for the moisture to go away as possible. A thin layer on a cookie sheet will make it far less likely that moisture will be trapped in your granola. 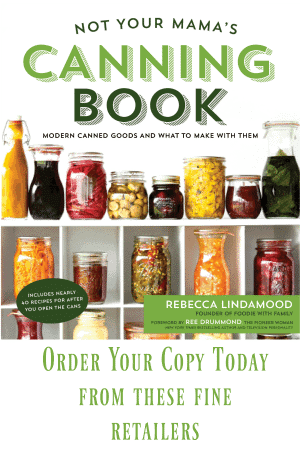 Only after it has reached room temperature all the way through should you transfer it to an airtight container to be stored at room temperature. If your granola becomes a little too soft, you can pop it onto a sheet pan and in the oven briefly at 350°F to re-crisp. 10 minutes should do the job without posing a scorching risk to your blueberries and coconut. Again, let it cool to room temperature before transferring to a container. I’m sure you know how to eat granola, but I want to share one of my favourite ways with you, as introduced to me by one of my little sisters. 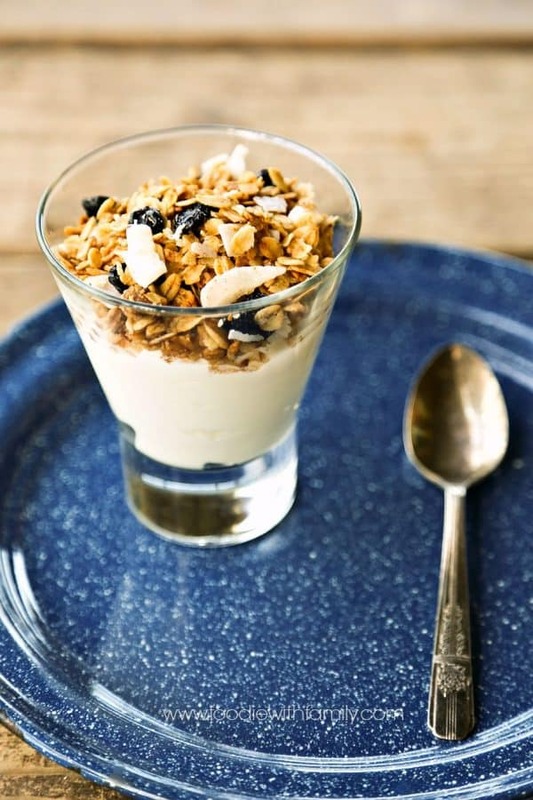 Before going to bed, I scoop 1/2 cup of yogurt into a parfait dish or small jar, top with 1/4 cup of Slow-Cooker Blueberry Coconut Vanilla Granola, cover, and refrigerate. In the morning, the granola has softened just enough to be chewy, but still has enough texture to be worth eating. It’s a lovely way to start the day. Fragrant, slightly sweet Slow-Cooker Blueberry Coconut Vanilla Granola. That's right! Granola made entirely in the slow-cooker without heating your kitchen! Use the butter or extra virgin olive oil to generously grease the entire inside of a crock for a slow-cooker. Add the old-fashioned rolled oats to the crock. Combine the coconut oil, maple syrup, ground cinnamon, vanilla extract and (if using) the ground vanilla or vanilla paste. Microwave for 60 seconds, or until the oil has melted. Briefly stir together with a fork or whisk then pour over the oats in the slow-cooker crock. Stir well to evenly coat the oats. Lay a chopstick over one end of the slow cooker and lay the lid on top. The chopstick should prop the lid open just slightly to allow moisture to escape. Turn the slow-cooker onto HIGH. Remove the lid and stir, taking care to scrape the sides, seams, and bottom- every 30 minutes until the oats have absorbed most of the liquid and the oats are toasted and smell slightly nutty. Divide the mixture between two rimmed half sheet pans and divide the blueberries and coconut between the trays. Mix gently to combine and allow to cool fully to room temperature before storing in airtight jars or containers. The granola should last for up to 2 weeks. If it begins to soften, you can briefly toast on a cookie sheet in a 350°F oven and cool to room temperature again. I go through those same fits also… I will cook something and eat it all the time and then not anymore for a while. This granola made in a slow cooker is genius! How have I never thought to make granola in the slow cooker! That’s perfect! Just let the slow cooker do all of the work! This over yogurt would be the perfect breakfast! Sounds amazing! Do you have an approximate time that this takes? Thanks! About 2 hours, give or take a bit. When it smells nutty and has evenly browned nicely, it’s done! 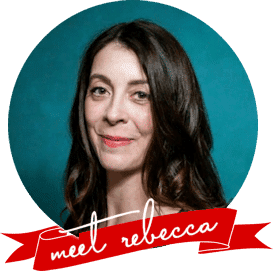 First of all, I love your blog and have used several of your recipes with great success , so thanks! But this one confuses me. Whenever I make granola, which is relatively often, I do it in a 300 degree oven for about 2 hours, no stirring involved, and with fewer dirty dishes since it can cook right on the sheet its baked on. I love my slow cooker for lots of hands-off recipes, but it seems like it’s just adding a step here. What’s the advantage to starting in a slow cooker with this recipe, or any granola recipe? Good questions, Tiffany! Every granola recipe I have includes stirring (even the low temp oven ones) because I want to release the moisture from the bottom and evenly toast my oats. Besides that, I make pretty large batches and even if I spread it between multiple sheet pans, I’m still going to need to move things around to keep it even. Now, as to why the slow-cooker? Mainly because it heats my kitchen less than an oven (even at low temperature) does. Since I don’t have air conditioning, this is a pretty nice thing for me in the summer. Oops, I meant cool, not cook. Have never heard of this method but you just gave me a great idea for Christmas gifts in a jar! Will give this a try today! This granola sounds wonderful. It is a lot like the one I make with almonds, dried cherries and coconut – of course, also in the slow cooker. Actually, the main things I use my slow cooker for are granola and yogurt making. I really like your idea for breakfast with yogurt and granola. Definitely something to try. Says stir every 30 minutes…..but not how long to cook. Can you give approximate cooking time? It depends a bit on how moist your oats are to start with… Mine usually takes about 3 to 4 hours.